British Foreign Secretary meets Netanyahu, expresses concerns over situation in Gaza. 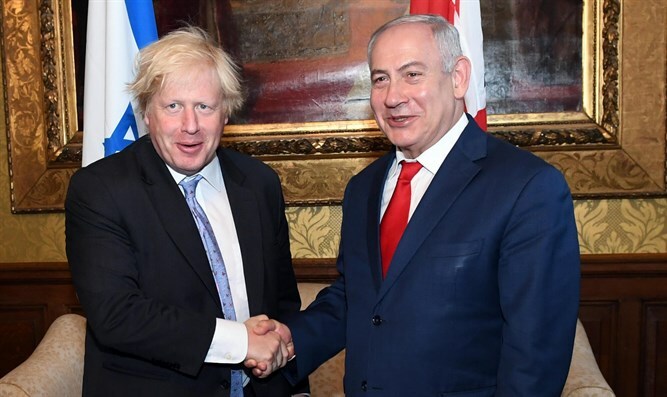 British Foreign Secretary Boris Johnson on Wednesday expressed the British government’s concerns over the situation in Gaza during a meeting in London with Prime Minister Binyamin Netanyahu. Johnson also stressed the UK’s firm commitment to a two-state solution as the best way to bring about stability and peace in the region, said the statement. “We are committed to making sure Iran continues to abide by its obligations under the deal and are in full agreement with Israel that we must prevent Iran from acquiring nuclear weapons,” he added. Earlier on Wednesday, Netanyahu met with British Prime Minister Theresa May and blamed the recent violence at the Gaza border on the Hamas terrorist organization. "As far as Gaza is concerned, I think the problems there are rooted in the fundamental goal of Hamas to destroy Israel. We’re not witnessing peaceful protests. In addition to burning our fields, these people are being paid for and pushed by Hamas to try to break into Israel’s defenses, kill as many Israelis as they can, right next to our border, and kidnap our soldiers," Netanyahu said. "This is not a non-violent protest; quite the contrary. We are doing everything we can to both minimize casualties, and at the same time protect Israeli lives. I think you recognize this. It’s a new technique, it’s a tactic of terrorists who attack civilian targets and hide behind civilians, or in this case use civilians as human shields. I think we should condemn it, and discuss ways how we can prevent this. 60 Gazans were killed in recent violent riots along the Gaza-Israel border. However, Hamas openly admitted that most of those killed were members of the group. Earlier this week, the IDF said that an initial investigation revealed that a Gaza medic who was killed during a violent riot at the Gaza border last week was not deliberately targeted by any Israeli soldiers, despite Palestinian Arab claims to the contrary. Razan Najjar, 21, was killed on Friday as thousands of Arabs converged in five places along the border. In addition to throwing rocks and burning tires, rioters launched incendiary kites over the fence, burning hundreds of acres of fields in southern Israel. Rioters also fired on an Israeli military vehicle and planted explosives along the fence meant to detonate on Israeli soldiers.